The 14th Annual National Law Students Workers’ Rights Conference will be held October 12 & 13, 2012, in Maryland at the Maritime Institute’s Conference Center. For full details on the agenda, speakers bios, and fees, please see the conference brochure. Students interested in attending may qualify for financial aid to support travel. Register by August 27 to receive a travel scholarship. Final deadline to register is September 28. Register online, or mail in registration form (see attached conference brochure for the form). Questions? View FAQs for answers to frequently asked questions. For additional information, please call 267-273-7990, ext. 2, or send an e-mail to mmoffa@peggybrowningfund.org. The Center for Reproductive Rights at Columbia Law School is excited to announce an exciting academic fellowship opportunity for recent law school graduates who are interested in careers in law and teaching. The Fellowship is a two-year (2013–2015), post-graduate fellowship designed to prepare recent law school graduates for legal academic careers in reproductive health and human rights. Fellows will be affiliated with the Center and the Law School and will participate in the intellectual life of both programs. Applicants do not need to be graduates of Columbia Law School to be eligible for this program. The deadline to apply is October 29, 2012. Today, the Department of Education proposed new student loan regulations, which include a repayment option that will make federal loan payments more manageable for certain borrowers. According to student loan expert Heather Jarvis, “In spite of the stupid name [ICR-A], the new repayment option ROCKS (if you can get it…).” Not sure yet what impact this will have, if any, on Public Service Loan Forgiveness. Read more to see if you qualify. 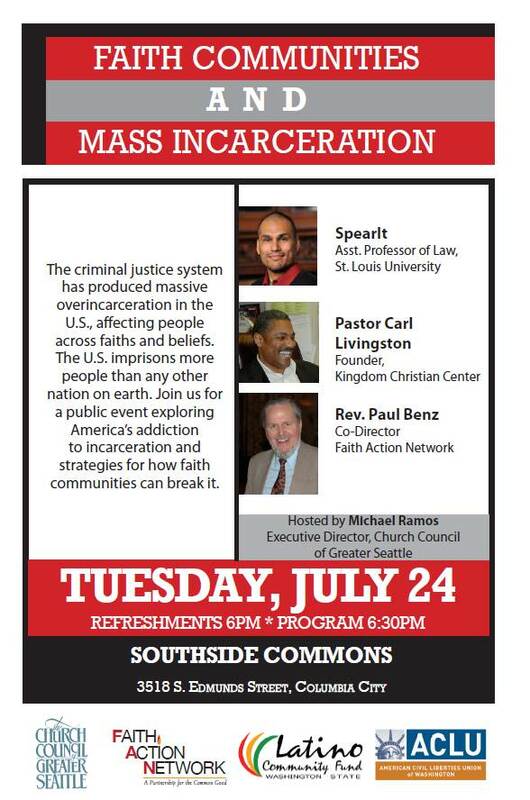 TOMORROW, July 24, 2012, at 6:30 p.m.
Join ACLU-WA, Faith Action Network, Church Council of Greater Seattle, and the Latino Community Fund on Tuesday, July 24th, for a public event exploring America’s addiction to incarceration and strategies for how faith communities can break it. The event will be held at the Southside Commons in Columbia City (3518 S. Edmunds Street, Seattle, WA 98118). Map here. Michael Ramos, Executive Director of the Church Council of Greater Seattle will host. See attachment for more information, or click here to learn more. The WSBA recently upgraded its online Career Center. Job seekers can find targeted opportunities, post résumés anonymously, and create job alerts. Employers can post jobs 24/7, manage recruiting efforts, and search the résumé bank (job postings go live within one hour of posting). The new Career Center resource offers benefits to job seekers and employers alike. Check it out. The 2013 Equal Justice Works Fellowship (EJWF) application is now open! Please visit the EJWF website for up-to-date information on how to apply, sponsor preferences, suggestions for writing a good application, and more. Want to apply? Register here for a free informational webinar, “How to Create a Successful Application for the Equal Justice Works Fellowships,” August 6, 2013. Visit the EJW website or a list of other upcoming webinars on topics ranging from educational debt relief to writing a successful resume. The Washington State Bar Foundation, the fundraising arm of the Washington State Bar Association, is seeking applications for open positions on its Board of Trustees. Application deadline is August 15, 2012. All terms are three years, renewable once, and begin Oct. 1, 2012. The Bar Foundation engages members of the bar and public in financially supporting WSBA’s diversity, public service, and public legal education programs. Foundation funding powers vital programs like the WSBA Moderate Means Program, the WSBA Home Foreclosure Legal Aid Project, and more. Trustees are stewards of the Bar Foundation, a 501(c)(3) nonprofit, and are actively involved in all aspects of donor development. Serving as a trustee is a great opportunity for anyone passionate about helping to sustain WSBA’s commitment to serve the public and advance justice. To be considered, please submit a cover letter and résumé by email to foundation@wsba.org. To learn more, contact Megan McNally at meganm@wsba.org, or (206) 727-8272.